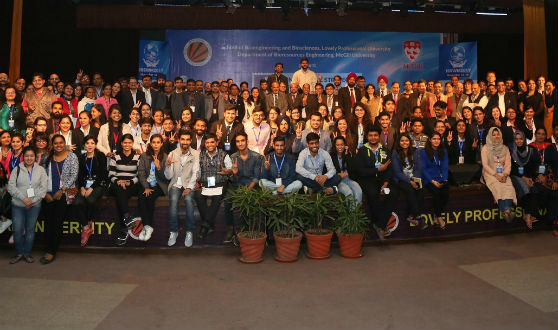 Jalandhar: As world today is drifting close to water scarcity and pollution, LPU and McGill University of Canada had organized two-day global conference ‘ISSWM (Innovative Strategies for Sustainable Water Management)-2017’ at LPU Campus, where scientists from across world gathered and contemplated how to reuse polluted-water as potable & cleaner. The principal objective of the second day symposium was to bring together 1000+ Ph.D scholars of the university to share innovative ideas and recommendations. Inaugurating the conclusive day, Conference Chairman & LPU Vice Chancellor Prof Dr Ramesh Kanwar made an emphatic appeal to all to “harness sustainable water management propositions and recommendations made at the conference through awareness & collaboration among individuals, peoples and nations. On this occasion, the best and outstanding 5 ‘Abstracts’ out of 132 were awarded with “Travel Awards” of Conference Testimonial and cash prize of Euro 180 each. Germany Publications ‘Springer Nature’ had sponsored the cash prizes. Siera Young from IOWA State University (USA); Dr Yogendra Shokeen from Sir Ganga Ram Hospital (New Delhi); Pradesh Babu from Amrita University (Kerala); Rajesh Kumar from Kumaon University (Nanital); and, Sandeep Kumar from Central Research Institute (Kasauli HP) received these prestigious honours. Prior to this, Executive Editor at Springer Heidelberg Publications (Germany), Dr Andrea Pillman, informed all scholars how to effectively publish and communicate their science-researches internationally. One of the Keynote speakers from Massey University, New Zealand, Prof Ranvir Singh talked about “Water Sensitive Growth – Planning, Tools and Technologies” and advised for precision irrigation as utilized in New Zealand, where only that much water is pumped out of the source which is required for the crops. Taking the example of North Western India (Punjab, Haryana, New Delhi), he informed that impressive growth here is putting increasing pressure on the limited land and water resources available and groundwater resources are depleting at an alarming rate. Reflecting on the challenges faced, he suggested less cultivation of those crops which consume much water and earn less revenue. He explained this in context to wheat and rice which are exported but with less income than expenditure on these. As such, important water is devalued in production of such crops. Here, he wanted help of all to develop productive and profitable agribusiness supply chain solutions by asking to improve water use and its management. He also suggested that waste water is to be taken as a resource and not a mere waste Instead of waste water treatment plants there should be recycling of waste water from kitchens, washrooms etc. LPU School of Bioengineering and Biosciences and the Department of Bio-resources Engineering, McGill University, Canada, had joined hands to gather 200 scientists, researchers and professors, from across the world at LPU campus for recommending effective solutions about utilizing polluted-water as potable and in cleaner ways. Scholars were from countries including Canada, USA, Germany, New Zealand, Bulgaria, Lithuania, Argentina and others. Previous articleBSE Institute hosts NITI Aayog Shuruaat Bus’s first pit stop in Mumbai!